Progressive Parlay bet explained. Are progressive parlays a better value than straight bets? Learn how this bet works, pays and compares to other alternatives. Also known as the “Close Call Parlay”. Choose from basketball or football. Combine 4 or more spread or total selections. Parlay wins even if 1 or more selections lose. Parlay loses if more selections lose than allowed. Payout amounts are lower than a traditional parlay. Choose from football or basketball. Select 4-10 point spreads, totals or combinations of both. Consider maximum number of losing selections allowed. Sportsbooks grade ties as losses. See tie rules below. Exotic Bet variant. Progressive Parlays or “Close Call Parlays” are commonly placed on football and basketball games. Sportsbooks restrict other leagues. Maximum payout rules apply. Most sportsbooks limit any single payout to $100,000-$150,000. All bets prohibited from standard parlays. Read more here. Full game Sides and Totals are only available for NFL. See sportsbook rules for other leagues. Assume -110 when juice isn’t specified. Saints vs. Texans Over -110. Cardinals vs. Seahawks Under -110. Sportsbooks grade progressive parlay ties as losses. Payout is $1,000 if all selections win. Bet pays $200 if one selection ties or loses. Bet loses if 2 or more selections lose. Review Progressive Payout table below. Each spread or total wins, loses or ties according to game outcome. Wins if all selections win. Pays less if any selections lose up to allowed number. Loses if more selections lose than allowed. Sportsbooks grade ties as losses. Payout is determined from remaining number of winning selections. Suppose Giants +3 ties the spread. Sportsbooks grades this selection as a loss. Bet pays 2-1 with 1 loss. Final payout is $200. Get paid even if 1 or more selections lose. Winning payouts are much higher than separate straight bets. See table below. Bet small amounts to win larger payouts. Ideal for those with limited bankrolls or extra cash for fun bets. Progressive Parlays under allowed loss limit pay more than a standard parlay with any losing selections. Remember, a single loss ruins a standard parlay. 5 selections with 1 loss pays less than 4 winning and 1 losing straight bets. See comparison table below. Progressive Parlays carry more risk and variance than separate straight bets. Multiple losing selections ruin entire bet. Separate straight bets allow more room for error and smaller percentage losses. A winning standard parlay pays more than a Progressive Parlay of the same size with no losses. Sportsbooks grade Progressive Parlay ties as losses. Ties reduce standard parlay size by 1 selection. Keep Progressive Parlays to 7 selections or less. Winning 8 or more selections is rare. Large parlay bets do not justify the risk. Reserve Progressive Parlays for a limited bankroll or a fun bet. They are not ideal for long term profitmaking. Analyze football and basketball ATS (against the spread) trends. Combine multiple winning teams into a Progressive Parlay. 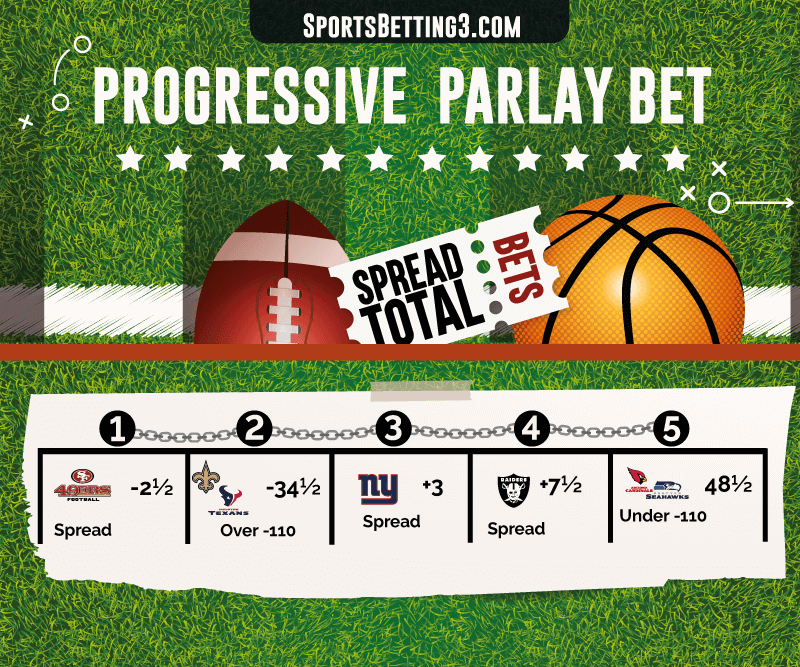 Compare Expected Value of Progressive Parlay vs. separate straight bets vs. standard parlay. Bettors can sometimes win more with separate straight bets. Combine opposite side of daily straight bets into a large Progressive Parlay. If all straight bets lose, make money back on a winning Progressive Parlay bet. March Madness Progressive Parlay – Choose 8 or more Round 1 Matchups. Pick optimal spreads or totals. You can still profit even if 2 or more of your selections are wrong. College Football Progressive Parlay – Choose 6 or more spreads, totals or both. You can still profit even if 1 or more of your selections are wrong. Progressive parlays were likely invented in the early 1940s, about a decade after Las Vegas legalized gambling in 1931. The term “Close Call Parlay” was coined in the past 20 years. It surfaced at VIP.com as another name for a Progressive Parlay. Offshore sportsbooks are responsible for popularizing this bet. They are not commonly available in modern Las Vegas brick and mortar sportsbooks. References to “Progressive Parlay” betting date to 1947 when the concept was incorporated into roulette betting strategy. Sportsbooks later adopted the term to denote a parlay which paid out even if 1 or more selections lost. Final payout amounts may vary with rounding. 4 winnning straight bets – 1 loser ($26.36) pays out more than a progressive parlay with 1 loss ($20). A winning standard parlay pays out more ($243.50) than a progressive parlay with no losing selections ($100). Straight bets are the most forgiving if up to 2 selections lose. But losing 3+ straight bets produces more loss than losing a $10 progressive or standard parlay entirely. Note: Some bets may be more or less profitable depending on the number of selections. Carefully compare profit and loss for different parlay sizes.